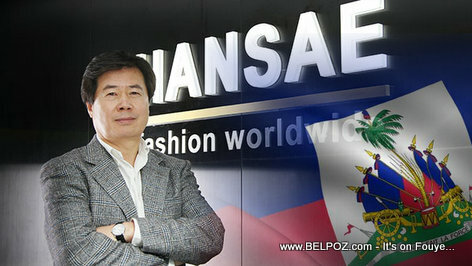 Haiti Business - Clothes Manufacturer Hansae to Build Factory in Haiti, 5000 jobs! KREYOL: Haiti Business - Konpayi HANSAE ap vini etabli yon Faktori nan peyi a, anviron 5000 job pwal kreye... Konpayi saa fè rad pou Nike, Gap, H&M, Abercrombie & Fitch... Kisa ou panse de sa??? "We will be able to expand exports to the U.S. because the U.S. doesn't impose tariffs on products manufactured in Haiti, this project will help bolster the company's competitiveness in many ways" a Hansae official said, according to The Korea Times. « S.O.S. Hinche Haiti, Cochon ap Raboure Lari a, SOS bay La Mairie, l'Etat Central, Martelly Souple!